No harm to beneficial insects when used at rates of 1/4 to 1/2 per cent of total spray tank mix (see notes*). Minimally processed Neem oil has broad range of insecticidal, anti-feedant and antifungal properties, especially when used with other natural products such as Karanja Oil and Garlic Oil. Brandt Super Wetter should be used in formulations where a highly effective, non-ionic, silicone based spreader is indicated. When applied properly, it works well to get full wetting of the leaf surface. 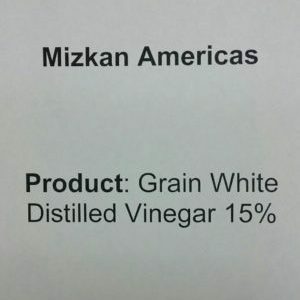 This is a highly concentrated product. 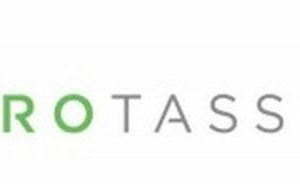 Foliar or drip application – efficient and rapid mineral uptake. Amino Acid chelated form of copper. Copper deficiency in plant determined by test, observation, and known nutritional needs of certain plants and/or growing systems. Albion Metalosate Copper provides easily absorbable and “plant friendly” copper for immediate use by the plant. 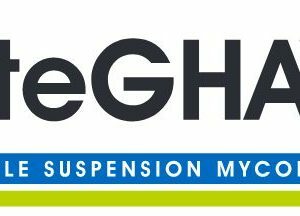 BoteGHA ES is a formulation of a strain of the naturally occurring insect parasitic fungus Beauvaria Bassiana Strain (see more info here and here). 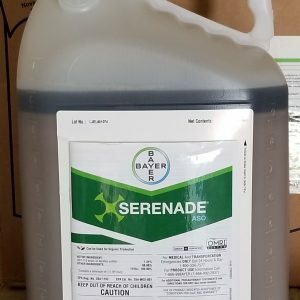 It is labeled for both foliar and soil application. It has the ability to infect most insects, and is especially effective in high humidity environments. When applied in the soil it may interrupt the life cycle of what are typically thought of as above ground insect pests, such as cucumber beetles, aphids, thrip, flea beetles, etc. 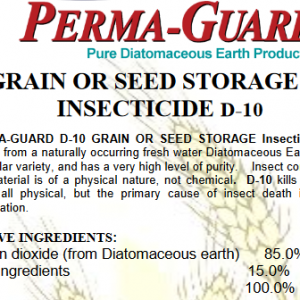 Grain or Seed Storage Insecticide D-10 is a natural silica product enhanced with permethrin, an effective conventional insecticide and PBO a catalyst that improves the efficiency of insecticides. 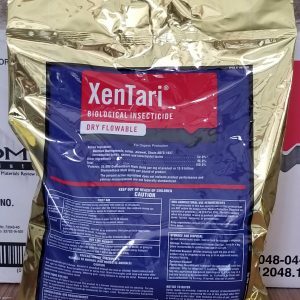 For use in the control of pests in grain storage. DE is a desiccant causing insects to lose body fluid and die by dehydration. 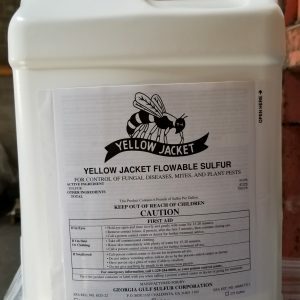 An organically acceptable liquid fertilizer which can be used throughout the season. 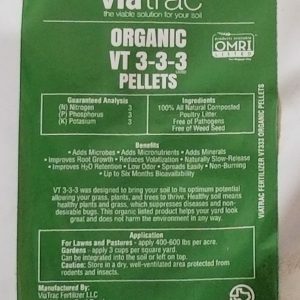 Stimulates rooting, plant vigor, and soil microbial activity. 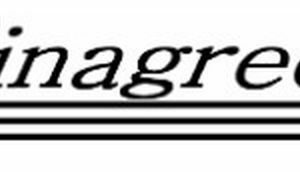 Phosgard Copper is a nitrogen, copper, and slow release phosphorus acid based fertilizer. 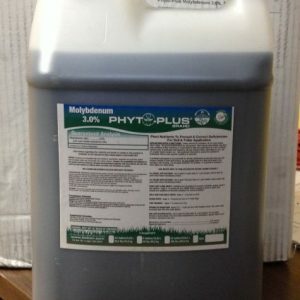 Phosphites have a positive effect on plant vigor, growth, and also stimulate root development. 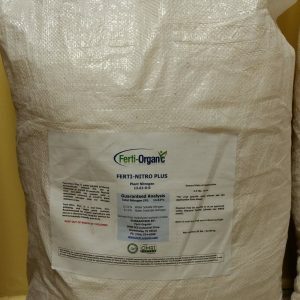 In addition to these benefits of phosphite fertilization, Phosgard Copper also supplies supplemental Nitrogen along with Copper micronutrients that may counter deficiencies in fast growing plants. 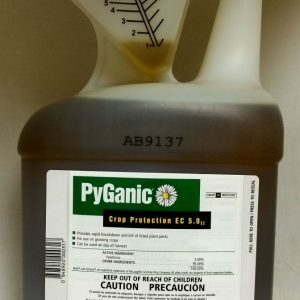 Useful in times of plant stress from environmental and/or insect and disease pressures. 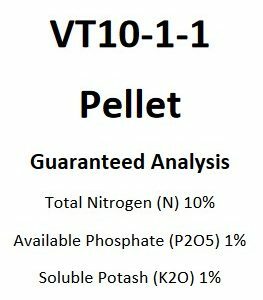 Phosphites can have a positive effect on plant vigor, growth, and also stimulate root development. Phosphate is an important macronutrient. 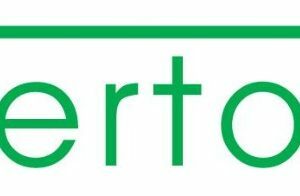 Fertoz Phosphate is recommended for soil or plant phosphate deficiency. 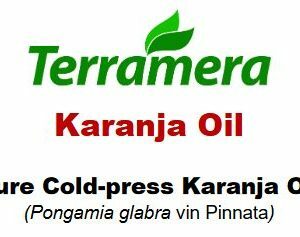 100% natural, cold-pressed Karanja oil. 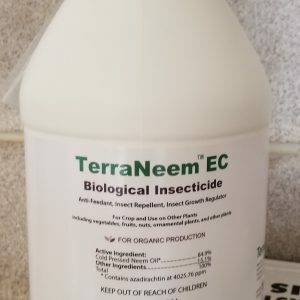 Adjuvant for natural insecticides and fungicides, especially Neem Oil. 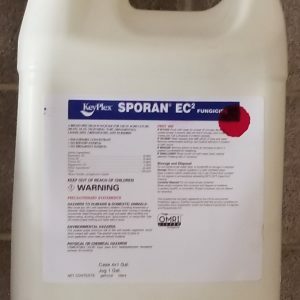 Used as an adjuvant in a tank mix with other natural insecticides as needed for control of insect pests. ((Bt) Bacillus thuringiensis – aizawai; ABTS – 1857 strain. 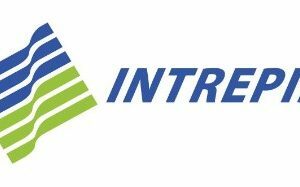 For control of lepidopterous insect pests of vegetables, fruits, and field crops. Any Lepidoptera infestation, but especially effective against armyworms and diamondback moths as compared to other Bt strains. 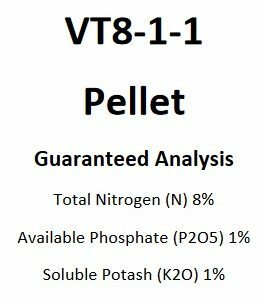 A blend of poultry feather meal and composted chicken manure with a guaranteed analysis of 8-1-1 (NPK). 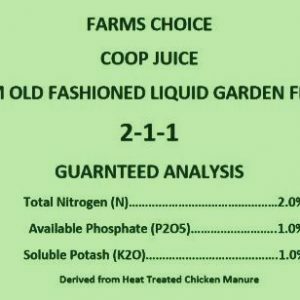 A blend of poultry feather meal and composted chicken manure with a guaranteed analysis of 6-2-2 (NPK). 3-3-3 with additional essential mineral nutrients and soil building carbon. 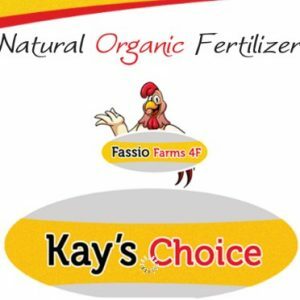 Derived from a naturally composted poultry litter. 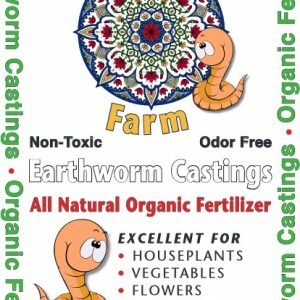 Promotes biological diversity in the soil. A need for balanced fertility, enhanced microbial diversity and support, and soil carbon. Biomin Copper is indicated when copper levels in the plant are below desired levels and need to be quickly restored to optimum. Copper deficiency (and toxicity) in plants is determined by test, observation, or known nutritional needs of certain plants and/or systems. Copper is critical to many plant functions, but overuse of copper can easily lead to toxicity, so the type and amount of copper applied to crops should be carefully measured and monitored. 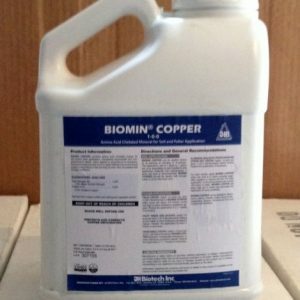 Biomin amino acid chelated copper provides easily absorbable and “plant friendly” copper for immediate use by the plant. Small amounts of copper are also included in the various Biomin Booster multimineral products, such as Biomin Booster 126 and Biomin Booster 153. 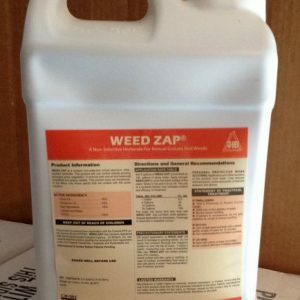 May eliminate small broad leaf and grassy weeds if used according to label. Smaller weeds (2 inches or less) are more easily controlled. 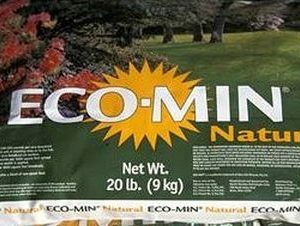 Multi-sourced mineral-based fertilizer derived from various rock sources, including granite and limestone. Low levels of molybdenum in soil or plant tissues. 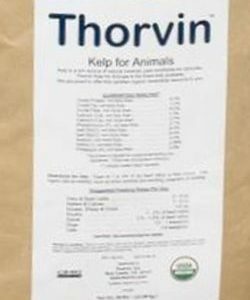 Promotes health and productivity naturally without chemically enhanced fertilizers. Broad spectrum contact insecticide. 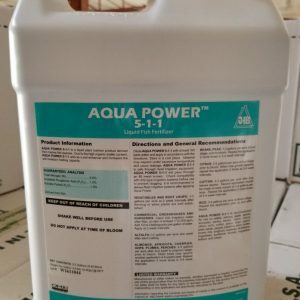 Works best at tank pH of 6.0 or below. 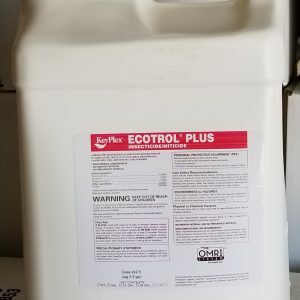 Constant BUpH-er and Mixwell are OMRI listed products available for tank water buffering. A need for rapid, broad-spectrum insect control. Potassium shortage in the soil. 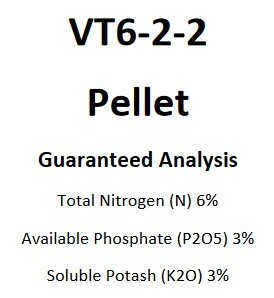 Sufficient available potassium in the root zone improves plant health and optimize yields. Weed Control when mechanical and cultural controls are insufficient. Smaller weeds (2 inches or less) are more easily controlled. Nitrogen deficiency in plants or soil. 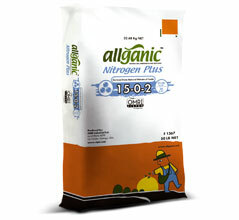 Allganic 15-0-2 is water soluble and so is especially useful when immediate Nitrogen uptake is needed, such as a shortage in the soil or periods of strong growth and fruiting of crops. 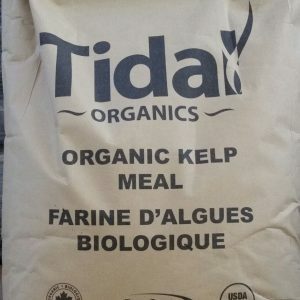 Being that this product in the Nitrate form, it is also especially useful in biological/organic growing systems where most of the Nitrogen is supplied in the form of ammonium. 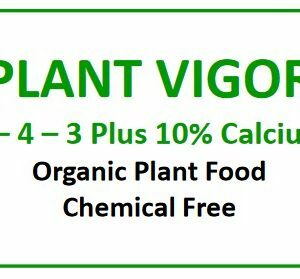 Many plants do best when supplied with Nitrogen in both of these forms. As needed for drip irrigation cleaning depending on water quality and frequency of fertigation. 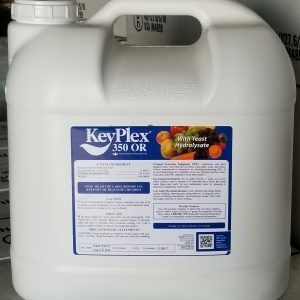 As needed for pH adjustment of spray tank water depending on water quality and other tank mix products.